Pop-ups are easy. Anyone can do them. Last night, I grilled some lamb chops, lit some candles, poured some wine and called it a pop-up. It was great, but I wouldn't want to do the same thing night after night. That's why something permanent is harder to sustain than a pop-up, and why it's good we're moving from the poppy to the permie stage of the development of the western fringe of the CBD. 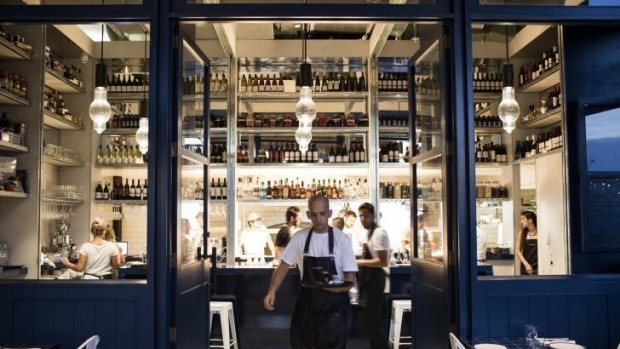 Anason is the first of the post-pop-up restaurants to open at Barangaroo, and while Rene Redzepi's Noma Australia may still dominate the Instawaves, Anason owner Somer Sivrioglu, of Balmain's Efendy, has slightly more modest aspirations. Modelled on the casual meyhanes, or drinking bars, of Turkey, it is essentially an open-air terrace backed by a great-looking interior kitchen and bar with glossy blue-tiled counters and bottle-lined shelves up to the (very high) ceiling, and a busy stainless steel kitchen and bread oven, wrangled by Sydney designer George Livissianis. 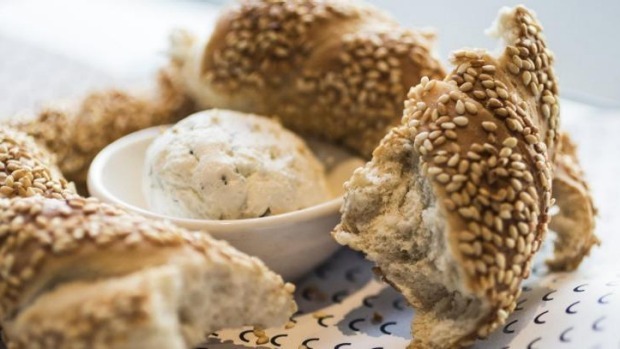 Outside, a sweet little Turkish food cart on the terrace catches the eye, loaded with simit, Turkey's quoit-shaped sesame-studded bread. Inside, Sivrioglu has assembled a team of young Turkish chefs from both here and there, including senior sous chef Murat Buvan, from Melbourne's Attica, and from Istanbul, Inal Erdener, previously of Alancha restaurant, and Ozge Donmezoglu, of Gram. 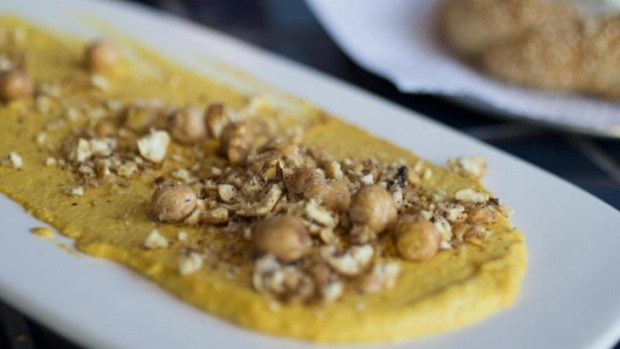 Rice-stuffed mussels ($3 each) are the perfect streetwise introduction, and the warm sunrise yellow of pumpkin hummus studded with crunchy fried chickpeas ($16) is just as appealing, especially when matched to a round of saj bread ($3) or simit ($6) for swiping. Don't let carb phobia hinder you from ordering the lahmacun ($9) as well. The small flatbread is topped with a pleasing mince of mixed lamb belly, rib meat and peppers and a spoonful of raw red onion, sumac and parsley salad ($9), ready to do-it-yourself into an eat-in-the-hands roll. Then there's our old friend, the steamed bao bun ($12), here stuffed with slices of lush, supple tongue and punched up with muhammara, a walnutty, garlicky red pepper paste, and fleshy purslane leaves. Good flavours, but it all feels very soft – and seriously, does every restaurant, whether Thai, Turkish or Tongan, need to do steamed bao? Carob-glazed lamb riblets are satisfyingly fatty, sticky, and on the bone, ready to rip into with your teeth, along with a tangy ezme salad of tomato and peppers ($25). Veal kofta ($26) should be the star of the show, but the little grill-marked patties feel dry. A whole squid "dolma" ($24) comes stuffed with a mushy "avo ganush", in a play on baba ghanoush. Desserts run from the snacky to the rich, as in a thick, creamy sutlac, rice pudding topped with hazelnuts, dried figs, apricots and dates ($14). To drink, there are "fat boys" of Turkish Efes beer, and Burak Cebi's fun-for-a-change Turkish-led wine list, with almost every entry obligingly available by the glass, carafe and bottle. The pinot-like 2012 Sevilen kalecik karasi ($12/$28/$54) is a good toe in the water; unchallenging, light-bodied and perfectly pleasant. In fact, the whole thing is a good toe in the water – very relaxed, unfussily casual and al fresco, as inspired by Sydney as it is Istanbul. A place to kick back, have a glass of raki, another plate, another simit. The young staff are over-the-top breezy, and servings can be smallish, but at least there's time for a bit of settling in and give-and-take. It's not going to pop off any time soon. Best bit: Eating outdoors is very relaxing. Worst bit: Continuing Barangaroo construction work. 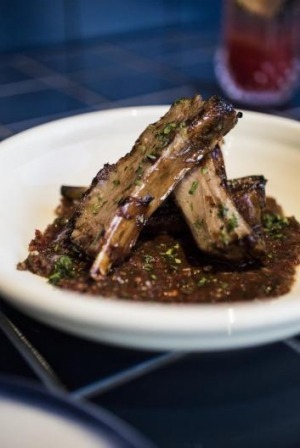 Go-to dish: Lamb riblets with tomato ezme, $25.